NFL Reaches Settlement with Former Players Who Suffer from Brain Injuries, Alzheimer’s, Depression | Democracy Now! host of NPR’s Only a Game, produced at WBUR in Boston. He’s been following the issue of concussions in sports for the past decade. The National Football League has reached a settlement with former players who accused it of profiting from the sport’s violence, while hiding the risks of concussions and repeated hits to the head. On Thursday, the NFL agreed to a $765 million payout to all past NFL players and the spouses of those who have already died. The settlement stems from a lawsuit filed by than 4,500 former players, some of whom suffer from brain injuries, Alzheimer’s disease and depression. This comes as the 2013 season football season kicks off for the NFL, colleges and high schools across the country. “I hope that the tremendous amount of publicity that’s been generated by this lawsuit will cause coaches and parents to think in a much more healthy way about how to take care of these kids and how to protect them and how to recognize the symptoms of concussions when they occur,” says Bill Littlefield, host of NPR’s “Only a Game,” who has followed the issue of concussions in sports for the past decade. JUAN GONZÁLEZ: We turn now to one of the most important developments in the history of the National Football League. On Thursday, the NFL reached a settlement with former players who had accused the league of profiting from the sport’s violence, while hiding the risks of concussions and repeated hits to the head. Now the NFL has agreed to a $765 million payout to all past NFL players and the spouses of those who have already died. The settlement stems from a lawsuit filed by more than 4,500 former players, some of whom suffer from Alzheimer’s disease or depression. AMY GOODMAN: The family of former Chicago Bears and Notre Dame safety Dave Duerson is among those who are part of the lawsuit. Duerson committed suicide in 2011 and left a note asking that his brain be examined for evidence of football-related damage. This is a clip from an ABC News report about what happened. REPORTER: He was exceptional, a four-time Pro Bowl safety, number 22, a two-time Super Bowl champ. SPORTSCASTER: Through the first four—this one’s for Giles, intercepted by Duerson! REPORTER: Teammates say Dave Duerson was also exceptionally smart and kind, which is why they were shocked when last week the 50-year-old killed himself with a gunshot to the chest. He sent a text message to his ex-wife hours before. ALICIA DUERSON: He told me he loved me very much, and he was truly sorry, and that he loved the kids, and that he felt—he thinks there was something wrong with his brain on the left side and for me to please get it to the NFL. REPORTER: Duerson asked his brain to be examined for chronic traumatic encephalopathy, or CTE, a degenerative disease often found in those with a history of concussions. CHRIS NOWINSKI: Football players are at a very high risk because they take, studies show, about a thousand hits to the head, each fall some—you know, at least 20 Gs, which is like a small car crash. So, essentially, your brain actually starts falling apart. Ten or 20 years later, you start getting symptoms like memory problems and emotional problems, and they eventually lead to dementia. REPORTER: Duerson, family members say, recently started having vision problems and struggled with spelling and forming words. The all-star knew of CTE. He served on the board that ruled on retired players’ disability claims with the NFL. ALICIA DUERSON: David was a very loving, caring man, and he always thought of others before he thought of himself—even in this moment, by him wanting his brain to be examined and treated, and so he could possibly help other football players in the future. AMY GOODMAN: The settlement will also allow the NFL to avoid disclosing details it had on concussion-linked brain problems. All of this comes as the 2013 season football—football season kicks off for the NFL, colleges and high schools across the country. For more, we’re joined by Bill Littlefield, host of NPR’s Only a Game, produced at WBUR in Boston. He’s been following the issue of concussions in sports for the past decade. Bill, welcome to Democracy Now! Let’s start off with—well, talk about the significance of the amount of this lawsuit and how it came about. BILL LITTLEFIELD: Well, it’s ironic, I think, Amy, that earlier in the program you were mentioning all these amounts of billions of dollars in other contexts. Seven hundred sixty-five million dollars is a lot of money, but the National Football League is a very large business that grosses somewhere between $9 [billion] and $10 billion annually, so it’s certainly not going to put a gigantic dent in their operation. On the other hand, it does constitute at least some acknowledgment that there is a responsibility on the part of the league to the, as you say, 4,500-plus players who brought a suit against them, primarily contending that the league did not come forward and acknowledge what it knew about the dangers of multiple concussions suffered playing football. JUAN GONZÁLEZ: And could you tell us about some of the most damning evidence compiled in the lawsuit that prompted the NFL to decide to settle, especially the role of a doctor who was in the lawsuit, named repeatedly, Dr. Elliot Pellman? BILL LITTLEFIELD: Yeah. Well, happily, Juan, a lot of that evidence is going to come out, even though there won’t be a trial, because there’s a book coming out very soon and a Frontline documentary called League of Denial, in which Dr. Pellman is featured. The charge against him, basically, is that, first of all, he was in charge of the concussion committee for the National Football League, and he had no particular specialty in neurology. He’s a rheumatologist. So, why he was even in that position has been brought into question. He was also the sideline physician, the team doctor for the New York Jets, and numbers of members of the Jets have said that they suffered concussions during games, Dr. Pellman looked at them, asked them a couple of questions, and then sent them back into the game. And for years, before this settlement, Dr. Pellman had been saying that there was no evidence at all that suffering multiple concussions would lead to any problems, brain problems, down the line. AMY GOODMAN: Bill Littlefield, you’re based in Boston, and I want to ask you about the former New England Patriots player, Junior Seau. AMY GOODMAN: First, here’s a clip about his long football career. REPORTER: Seau was born in January 1969 in San Diego. He grew up in the North County and excelled at sports at Oceanside High School. He later accepted a football scholarship at the University of Southern California. In 1990, the linebacker was taken in the first round of the NFL draft by his hometown team, the San Diego Chargers, and anchored the defense for 12 years. He helped lead the team to its only Super Bowl appearance in 1994, where they lost to the San Francisco 49ers. He was traded to the Miami Dolphins, where he played for three years. Seau retired in 2006—for one day. He returned to the NFL with the New England Patriots but never got the championship he was chasing. The superstar left pro football in 2009 after 20 years. AMY GOODMAN: Well, in 2012, Junior Seau died of a self-inflicted gunshot wound at the age of 43. He was suffering from chronic traumatic encephalopathy. Seau left behind four children. His sons Jake and Tyler spoke to ESPN earlier this year. JAKE SEAU: He lived for those games, Sunday and Monday nights, you know. And to find out that that’s possibly what could have killed him or caused his death is really hurting. TYLER SEAU: Makes me realize that he wasn’t invincible. You try to be like that man in your life, play the game the way he did, work the way he did. And, you know, now you look at it in a little bit different view, and is it worth it? I’m not sure, but it’s not worth it for me to not have a dad. AMY GOODMAN: Junior Seau’s family donated his brain to research. His family’s also part of Wednesday’s settlement. Bill Littlefield, can you talk about the brain injuries he faced? I mean, astounding, he and others committing suicide, but not shooting themselves in the head, so they could donate their brain to research. BILL LITTLEFIELD: Right, a conscious act to try to help fellow players in the future. Seau’s case was particularly powerful, I think, because not only was he a very talented and very accomplished football player who had a very long career, he also had a reputation of being a terrific teammate, a guy that helped the team simply by being a presence in the locker room. And so, that was a larger-than-normal story even, because his life was so—he was so energetic and so straightforward and an admirable guy to many fans. So it was a particularly powerful story. JUAN GONZÁLEZ: And could you tell us also about this—you mentioned this upcoming Frontline documentary, and the sudden decision of ESPN to pull its connection to the documentary? JUAN GONZÁLEZ: It’s set to air on October 8th, and it investigates the NFL’s response to head injuries among football players. This is a part of the trailer. UNIDENTIFIED: Mike Webster is top 100 players of the century and the best center ever to play the game. PAMELA WEBSTER: It was this change in personality where he didn’t trust anybody. He thought everybody was out to get him. That wasn’t the Mike I knew and loved. That was the brain injuries. UNIDENTIFIED: He was homeless, and he was living in the bus station. UNIDENTIFIED: It wasn’t until 2002, when Mike dies, for the first time physical evidence. PATHOLOGIST: Mike Webster is on the autopsy table. I was not aware of who Mike Webster was. I didn’t know what a Super Bowl was. PATHOLOGIST: This is a new disease. NARRATOR: … of the discovery that could change the game forever. PATHOLOGIST: And it’s never been recorded before in a football player. UNIDENTIFIED: These players come down with dementia, and then Alzheimer’s, and then they’re gone. DR. ANN McKEE: The brain is riddled with disease. That was pretty ominous. NARRATOR: Frontline investigates what the NFL knew, and when they knew it. PATHOLOGIST: You can’t go against the NFL. They’ll squash you. DR. ANN McKEE: I’m really wondering where this stops. I’m really wondering if every single football player doesn’t have this. JUAN GONZÁLEZ: That’s a clip from an upcoming PBS Frontline documentary set to air October 8th. The program issued a statement last week that, quote, “From now on, at ESPN’s request, we will no longer use their logos and collaboration credit on these sites and on our upcoming film League of Denial. … We don’t normally comment on investigative projects in progress, but we regret ESPN’s decision to end a collaboration that has spanned the last 15 months.” Bill Littlefield, could you talk a little bit about the background of what led to this decision of ESPN? BILL LITTLEFIELD: Well, according to a spokesperson for ESPN, there were two particular things that led to it, Juan. One was that Dr. Ann McKee, who you heard at the end of that promo, saying that she wondered about whether every football player perhaps had this problem, had this condition. And the other was a bit from the beginning of the promo, where the Frontline people put in the line, “This may change the way you look at football.” I think the people at ESPN are very happy with the way people look at football right now, because they look at it in great numbers on ESPN. And I think that they—President Skipper of ESPN said that he found the language of the documentary sensational, and he objected to the fact that it hadn’t been run by him or run by somebody at ESPN before that promo came out. BILL LITTLEFIELD: Well, slow-motion replays and highlight films, right. JUAN GONZÁLEZ: And the highlight films of these incredible hits of football players. It’s really the bread and butter of what they use to attract fans to their broadcasts. BILL LITTLEFIELD: It certainly is a big part of the way the game has been advertised over the year—over the years, and that has, I think, somewhat diminished recently. 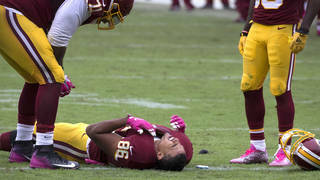 But it’s only very recently that the National Football League has acknowledged that the concussions that players suffer as a part of doing the work that they do as pro football players has a connection to the damage that we’ve been talking about this morning that these players experience later in life. AMY GOODMAN: In February, Democracy Now! spoke with Chris Nowinski, the author of Head Games: Football’s Concussion Crisis, former professional wrestler, who’s now a leading expert on sports-related head injuries, and also a former football player at Harvard University. He’s now co-director of the Center for the Study of Traumatic Encephalopathy at Boston University School of Medicine, which maintains a bank of ex-athletes’ brains to study the effects of concussions. I asked Nowinski about his experience with brain injuries and what it means to have a concussion. CHRIS NOWINSKI: I didn’t know I was getting concussions my entire career, until it was too late. When I was on the field, whether playing football or wrestling, I’d get hit in the head, and I would black out. I’d forget what I was doing, the sky would go orange, and I would just try to tough it off. And what we’ve learned through our research at Boston University is that, over time, that can trigger a degenerative brain disease that will eventually, you know, take away your memory, your—your ability to put together sentences, like right today. But in our last study we published in December, 34 of 35 former professional football players had this disease, nine of nine former college players, and even six high school players. So, we’re really concerned about the football—the last few generations of football players. AMY GOODMAN: That was Chris Nowinksi, author of Head Games: Football’s Concussion Crisis, who, of course, himself has suffered from a number of concussions. AMY GOODMAN: Bill Littlefield, can you talk about what he has to say, and also exactly how the money in this massive settlement is going to be divided? BILL LITTLEFIELD: Well, the money is going to be divided according to the age and the level of damage that’s been diagnosed in some of the players. What I feel good about, in terms of this settlement, is that the money will be available to people, to men and to the families of these men, who really need the money to care for them more quickly than it would have been available if this thing had dragged out and gone to court, because there would have been delays, there would have been appeals, and some of these guys who really need the help and care might have been dead by the time the money arrived. What I feel badly about is that through the trial process we won’t hear what the NFL knew and when it knew it. And it seems to me very, very obvious that the National Football League was aware of the damage that multiple concussions and the damage that going back into a game after suffering a concussion, and potentially suffering another one before the brain has the opportunity to recover—they were aware of this kind of damage, because the medical community, to a great extent, has been aware of that syndrome for some time. So, I wish that that was going to come out. Now we’re going to have to see it come out via books and documentaries and studies and investigative reporting rather than through the trial processes, which is OK, because that secondary process has—is well underway. JUAN GONZÁLEZ: And, Bill Littlefield, the ramifications for others who play football? There are millions of young people in colleges and in high schools that are playing football every day. What’s going to be the impact, long-term, on the way that this sport is played? BILL LITTLEFIELD: Even, Juan, down to Pop Warner leagues, where the kids are much younger, and their brains are much less developed, and they’re banging into each other. I hope that the tremendous amount of publicity that’s been generated by this lawsuit will cause coaches and parents to think much more—in a much more healthy way about how to take care of these kids and how to protect them and how to recognize the symptoms of concussions when they occur, because if that doesn’t happen, then the damage will simply keep occurring. AMY GOODMAN: Bill, is it possible to play football safely? BILL LITTLEFIELD: That’s an excellent question, Amy, and I don’t know the answer. I didn’t play football. I played for one day. I got hit in the head. I didn’t like it, and I went to play something else. I played soccer instead. But it’s an excellent question, and I think it’s a question that the NFL and lots of major college programs are going to have to confront. AMY GOODMAN: Well, Bill Littlefield, I want to thank you very much for being with us, host of NPR’s Only a Game, which is produced at WBUR in Boston. He has been following the issue of concussions in sports for the past decade. When we come back, we’re going to look at the Justice Department saying it will not sue to block laws legalizing medical or recreational marijuana in 20 states and the District of Columbia. We’ll speak with Martin Lee. Stay with us.